One of the most commonly mixed-up concepts in investing is the difference between market volatility and market risk. Many people treat them identically, which is a mistake. And you can profit from that mistake. Risk is the probability that an investment will result in permanent or long-lasting loss of value. Volatility is merely how rapidly or significantly an investment tends to change in price over a period of time. The reason this is important is because volatility doesn’t necessarily address how sturdy an investment’s value is. Price is what you pay for an investment, while value is what you get. Although price and value are related, they are not identical. An investment could fluctuate wildly in price even though its value remains fairly steady over the long term. In that case, what’s changing is merely the market perception of the value, especially over the short term. Volatility is therefore something that must be managed if you need to withdraw your money within a specified timeframe. Value investing is the original investment strategy to take advantage of the difference between price and value, and it relies on buying shares of companies for which the stock price is mistakenly below the real value of the company. But there are several ways to take advantage of the difference, and this article will cover them in detail. Consider what happens in a recession. Businesses lay off employees and invest a lot less money in expansion, while households may have lower income and will try to reduce their expenses to stay afloat. Companies that sell products and services to other companies, or that sell products that people can live without, often run into the most trouble. Those are the types of expenses that people cut back on first. On the other hand, companies that sell consumer staples like soda, packaged food, cigarettes, and alcohol, tend to be almost unaffected. We could say, then, that companies in the first category are riskier than companies in the second category. But this wouldn’t quite be accurate. Emerson Electric and Dover Corporation are two classic examples that defy intuition. They are both engineering companies that primarily sell to other businesses. When the 2007-2009 financial crisis happened, their earnings went down by over 30% each. Meanwhile, if you look at the annual earnings of The Coca Cola Company or Johnson and Johnson, you can’t even tell there was a recession then. They just kept going like nothing happened. So, the engineering companies are demonstrably more volatile. Their stock prices are more volatile, and their actual earnings (which can affect their value) are more volatile. However, Dover and Emerson have over six decades of consecutive annual dividend growth without interruption, which is even longer than Coca Cola and Johnson and Johnson. Dwight Eisenhower was the U.S. President and interstate highways didn’t even exist yet when Dover and Emerson began raising their dividends each and every year. The world changed around them dramatically and yet they were robust enough to get through no fewer than nine recessions without failing to grow their dividends to shareholders. Their products and services have been diversified enough that no single problem has ever been enough to capsize them. Clearly, the risk of permanent capital loss from these companies was low, at least when investors bought in at reasonable prices. Their earnings were more volatile than companies that make consumer staples, but their ability to generate cash flow growth over the long-term has been highly consistent. 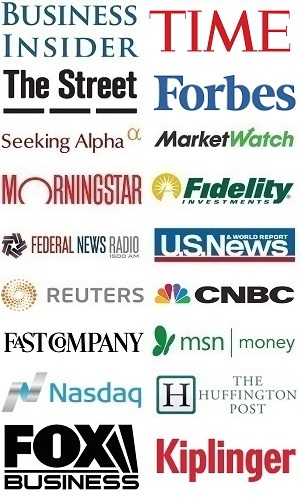 All of these companies face some degree of real risk. A significant part of Emerson’s profits are tied to the energy industry, for example. Coca Cola has to shift to healthier products in a world where soda might not be as popular. Johnson and Johnson has to maintain a robust pharmaceutical pipeline and minimize lawsuits regarding their products that lives depend on. But just because some companies are more volatile than others does not necessarily mean they are riskier than others when you’re looking ahead over a full business cycle. The number one thing that has to do with how safe the cash flows of a given company are, is whether the company has an economic moat, not whether they are immune to recessions or not. Emerson and Dover stayed in business so long even in an industry where earnings tend to fluctuate primarily because they established wide and deep moats around their businesses. The idea of an economic moat was coined by Warren Buffett to describe companies that have a durable competitive advantage against other companies, like a moat that protects a castle. A fashion retailer, for example, has little or no moat. Consumer tastes can change, and their prices are largely based on perception. It’s not a very capital-intensive business, so there’s nothing stopping another retailer from coming along next year and being slightly trendier, with a slightly better marketing campaign, and resulting in far fewer people buying from the first company. It’s easy to imagine creating a new fashion retailer that could compete against the current marketplace. But can you imagine how you’d try to compete against UPS? Where would you possibly start? They have a multi-billion dollar portfolio of facilities, trucks, planes, and trained personnel covering the entire country and stretching abroad. Deutsche Post DHL, the world’s largest courier, spent $10 billion trying to establish a foothold in the U.S. delivery market against the corporate duopoly of UPS and FedEx, and failed miserably. DHL lost so much money that they had to bow out of the market for years, and come back as just a niche courier. The moats of UPS and FedEx were simply too wide and too extensive in the United States for even the world’s largest logistics company to compete. In order to break those companies, you’d most likely have to make shipping itself irrelevant, which even if it happens through some futuristic 3D printing technology or something, will never happen overnight. Reducing investment risk means buying investments that have a moat in some way or another. This means that their cash flows are protected from competition, most serious risks they face are only the very long-term variety rather than things that could happen quickly, and they have conservative balance sheets that allow them to weather recessions and other temporary problems. In addition to buying businesses with wide economic moats, the second critical thing for reducing risk is to buy at a price that is at or below the fair value of the investment. To do that, you need to apply discounted cash flow analysis or a similar valuation technique that’s based on the actual value that the company produces. And lastly, the third step to reducing risk is to diversify appropriately. Don’t put all your money into one investment, even if it’s the safest company you can find. You never know when something might happen. Invest in several companies and invest in other classes of assets besides equities. If you stick to companies that have wide economic moats, at or below their calculated fair values, and you diversify appropriately, your chance of permanent capital loss is extremely low in all but the most catastrophic of circumstances like global wars or natural disasters bad enough to destroy a national economy. Assuming your investments are the low-risk variety, as discussed above, you can actually make more money from higher volatility compared to lower volatility. All else being equal, volatility is a good thing for smart investors, because volatility is what creates opportunity. Traders tend to overreact to bad news, creating instances where the stock price is lower than the value of an investment. For some examples, see my article on contrarian investing. Option premiums are higher in periods of high volatility as well, so the investment strategy of selling put options and covered calls will result in particularly high investment income (and ironically, will usually keep your portfolio volatility quite low). Above all else, keeping an eye on market valuations and instances of high volatility can lead you to make wise decisions for asset allocation, regardless of whether you pick individual stocks or not. 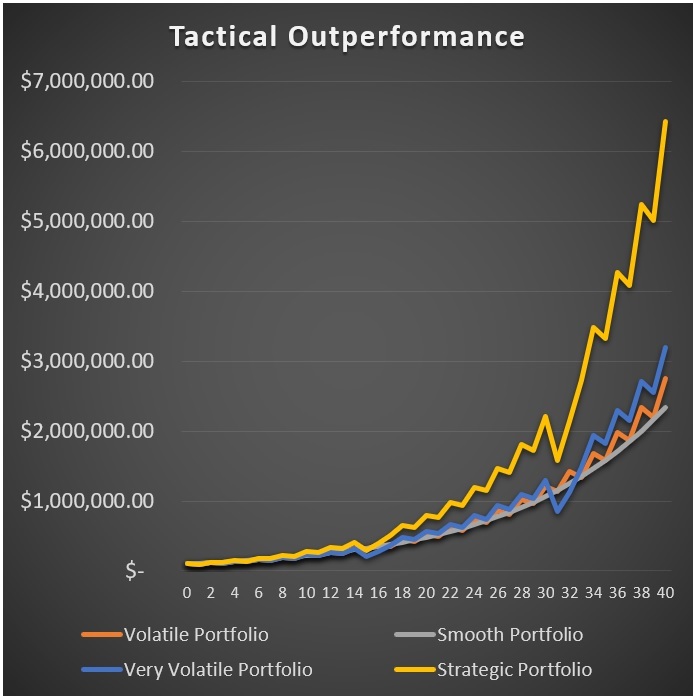 The rest of this article will focus on a detailed case study to show, quantitatively, how volatility can benefit a portfolio. It had massive declines in 1987, 2000-2002, and 2007-2009, and yet still increased in value by 20x over the period. The total return including reinvested dividends would have further multiplied that figure. 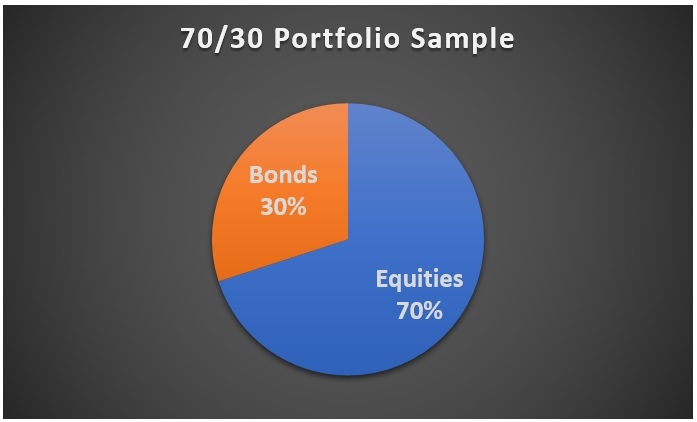 For this example, I’m going to use a 70% stock, 30% bond portfolio as the default selection. Every year, the portfolio will be re-balanced to that ratio. So if stocks go up, some of them will be sold in order to buy bonds and get back to the 70/30 split. If stocks go down, some bonds will be sold to buy more stocks. Every year, it gets back to 70/30, and this is the basis of how most smart index fund strategies work. Now, I’m going to put that portfolio through three potential scenarios in Excel to see how they grow differently, followed by a big fourth and final scenario. 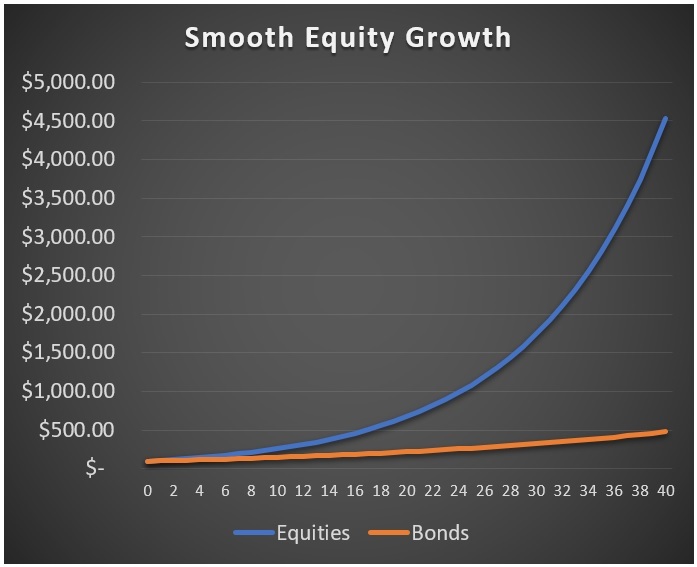 That chart shows how $100 would grow separately for equities and bonds. If that result happens, and the portfolio is re-balanced once each year, then the result will be a smooth 8.2% annual compounded growth rate of the 70/30 portfolio. Now suppose in this scenario, equities instead fall by 10% in odd years and grow by 34.44% in even years. The result is that equities still end up growing by the same 10% average rate over a 40 year period, and reach the same final number. We’ll check in a bit to see how the rate of return of this re-balanced stock/bond portfolio does compared to the previous scenario. Now suppose that this scenario is identical to the previous one, except that equities also experience big 50% drops in years 15 and 31, followed by three-year recoveries each time. Over time, the more volatile portfolios start to slowly outpace the smooth portfolio, even though equities overall are growing at the same long-term rate in each scenario. 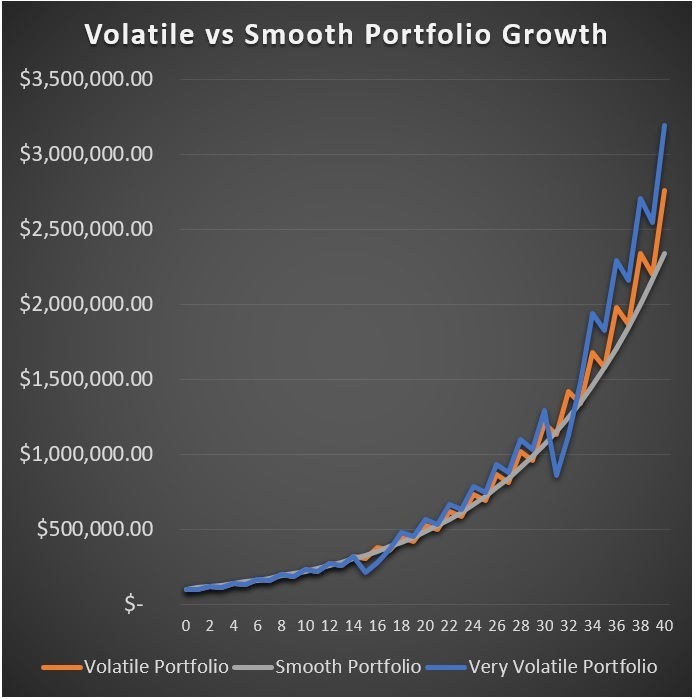 For example, by the end, even the bad years for the volatile portfolio (orange), are slightly higher than the smooth portfolio (gray), and the good years of the volatile portfolio are a full $400,000 ahead. The very volatile portfolio (blue) starts to outpace both of them. If this were extended over an even longer timeline, then even the worst years would be higher than the other two. The reason for this is that the volatility gives better opportunities for re-balancing. Naturally, re-balancing means passively buying stocks low and selling them high. When stocks go up quickly, some of them have to be sold to buy bonds and get back to the 70/30 split. When stocks fall sharply, bonds have to be sold in order to buy more stock. In the smooth scenario, stocks are never purchased after the portfolio is set up. Because stocks do better than bonds every single year, a portion of stock is sold off each year to buy more bonds. But in the two volatile examples, the good stock years mean selling stocks when they’re high, and the bad stock years mean buying stocks when they’re low. Overall, the difference is meaningful but not overly huge, especially if we were to account for inflation. Market crashes do not necessarily have to ruin a retirement, as shown here. It only ruins a retirement when investors keep pulling money out of stocks right after a market crash, and thus fail to benefit from the recovery. It’s the worst thing an investor can do. Over the past century of the United States stock market, a re-balanced portfolio of stocks and bonds would have provided decent growth over any 20-year period. All investors have to do, is leave it alone. Except in this case, the portfolio will not be re-balanced to 70/30 each time, unlike the previous three scenarios. Instead, after the years of high equity returns, it will be re-balanced to 60/40, and after the years of equity drawbacks, it will be re-balanced to 80/20. That’s the only difference. In other words, when stocks do well, the portfolio manager gets cautious, and increases the bond exposure a bit. When stocks do poorly, the portfolio manager gets aggressive, and slightly increases the stock exposure. It does overwhelmingly better, just from a simple pattern of portfolio adjustment. It doesn’t involve any extremes. It never goes 100% into stocks or 100% into bonds. All it does, is shift to a slightly more aggressive portfolio orientation (80/20 stocks-to-bonds instead of 70/30) after stocks fall, and shift to a slightly more conservative portfolio orientation (60/40 stocks-to-bonds instead of 70/30) after stocks rise considerably. And just from that tiny tactical adjustment compared to scenario 3, it doubles the money by the end. It disproportionately benefits from market recoveries while preserving capital better when stocks fall. In order to demonstrate a point, these scenarios used patterns. In trying to replicate scenario four in particular, no portfolio manager or individual investor will be able to get it right every time. Backtesting like this is interesting but it’s not necessarily instructive on how to proceed going forward. However, notice that this didn’t necessarily involve market timing. At no point was the manager of portfolio four saying, “I think this is what will happen next year”. 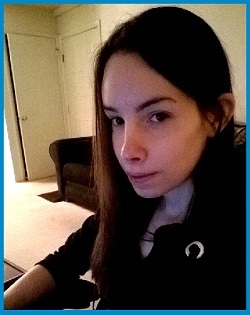 Instead, she was merely adjusting the portfolio based on what already happened. She was saying, “after this big recent stock surge, I’m going to shift a bit towards bonds” and “after this big stock slump, I’m going to put a bit more into stocks than before”. She was taking advantage of the volatility to manage her risk appropriately. That’s exactly the opposite of how most people invest, unfortunately. They get excited and buy when stocks have already gone up a lot, and then when stocks inevitably have a crash or correction, they get fearful and sell at low prices and miss out on the eventual recovery. This hypothetical portfolio manager was successful because she did just the opposite; she took a contrarian approach and bought stocks when they were cheap, and was cautious of stocks when they had already gone up. 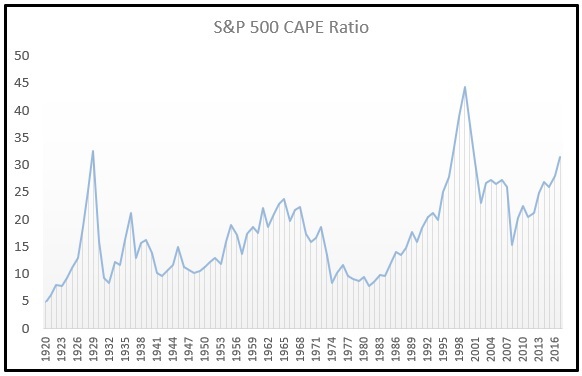 The CAPE ratio of the S&P 500 is one measure of how highly valued the price of the market is compared to the value (aka the actual corporate earnings) of the market. 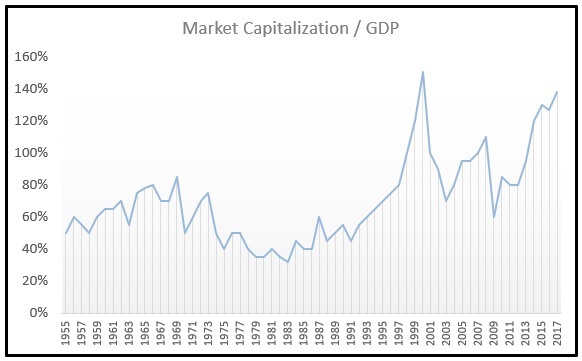 Similarly, the Cap/GDP ratio takes the total price of all shares of publicly traded corporations (the price investors are paying in aggregate) and divides that figure by the current GDP of the country (which measures actual economic output), and therefore supplies another value/price ratio that we can look at. Read more about those valuation methods here. Historically, more than a century of data shows that when the market is overvalued, as measured by CAPE or Cap/GDP, equity returns over the next 10-20 years tend to be poor. In contrast, whenever the market is undervalued, equity returns over the next 10-20 years tend to be quite good. This holds true almost every single time. Similarly, backtesting over decades has evidenced that if you adjust a portfolio based on the CAPE ratio, you can outperform a static stock/bond asset allocation. In other words, during times when the CAPE and Cap/GDP ratios become high, you shift more towards bonds, and when the CAPE and Cap/GDP ratios become low, you shift more towards stocks. This mirrors pretty closely what scenario 4 did strategically. A similar strategy of assessing market valuation and risk is to pay attention to business cycles. All free markets have periods of expansion and contraction. Pundits guess left and right when we’ll have the next recession or bull market, and in truth, nobody can know for sure. Their track records in aggregate are terrible. I personally never make predictions about what will happen over a few years; I only look at market valuations for the most part. What we can do, however, is know something about the statistics involved. There have been 49 recessions in US history, as defined by a broad economic contraction lasting over six months. Back in the 1800’s, they use to happen very frequently, with the country spending almost as much time in recessions as it did in periods of expansion. We’ve had 14 recessions since (and including) the Great Depression, which is a more useful and modern period of measurement. Most of them lasted less than one year during this time, and they usually happened between 3 and 8 years apart. The longest market expansion in US history was between 1991 and 2001, which lasted for 10 years. The longest recession began in 1873 and lasted for five and a half years. The Great Depression lasted for less than 4 years. As the market continues to expand, investors tend to become more and more optimistic, driving the CAPE and Cap/GDP higher and higher. Then when a recession and market contraction occurs, investors usually overreact and drive the CAPE and Cap/GDP ratios lower than they should be. 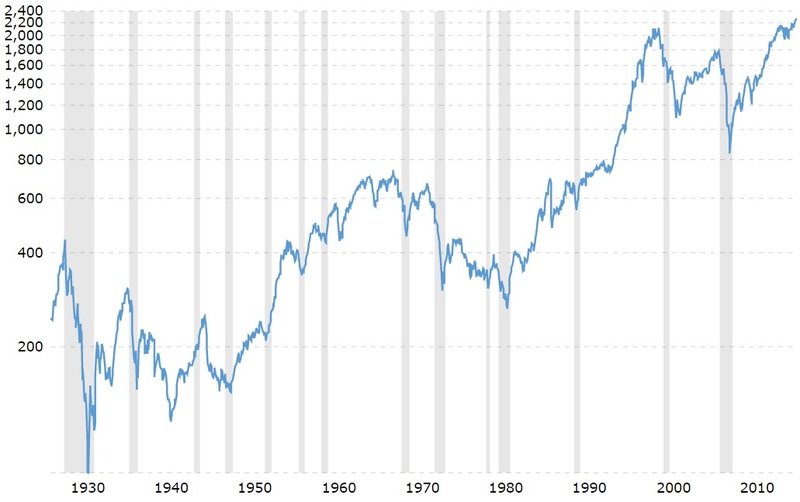 Ideally, then, we want to have a lot of equity exposure at the start/bottom of a business cycle, when stocks are cheap and when there is plenty of time for expansion, and we want to reduce equity exposure towards the end/top of a business cycle, when stocks are expensive and when a recession or market correction is becoming more and more likely. The trick, of course, is that nobody has been able to reliably predict exactly when market cycles will start and finish. Since we’re currently 8.5 years into an economic expansion, all we can say is that we’re in the third longest expansion in US history, we’re only a couple years ago away from hitting the record, and both the CAPE and Cap/GDP ratios are extremely high. It’s probably a good time to be cautious and to diversify away from equities, without dumping equities entirely. As scenario 4 showed, it only takes small adjustments in your asset allocation to preserve wealth through contractions, benefit greatly from recoveries, and to produce outsized gains. It’s not about predicting when markets will expand or contract. Instead, it’s about paying attention to the current valuations of the markets and then subtly noting also how far into a business cycle you are. Personally, because interest rates are so historically low, I’m not allocating into bonds except for in my indexed 401(k). Instead of putting money into bonds, I’m investing my non-equity positions into international stocks, precious metals, and cash-secured put options. These collectively are serving similar roles as bonds in my portfolio; they are designed to provide solid returns and cushion the effect of a market contraction on my portfolio. In an extremely low interest rate environment, I consider them superior to bonds on a risk/reward basis. Understanding the difference between market volatility and market risk is a key skill for investors to have. 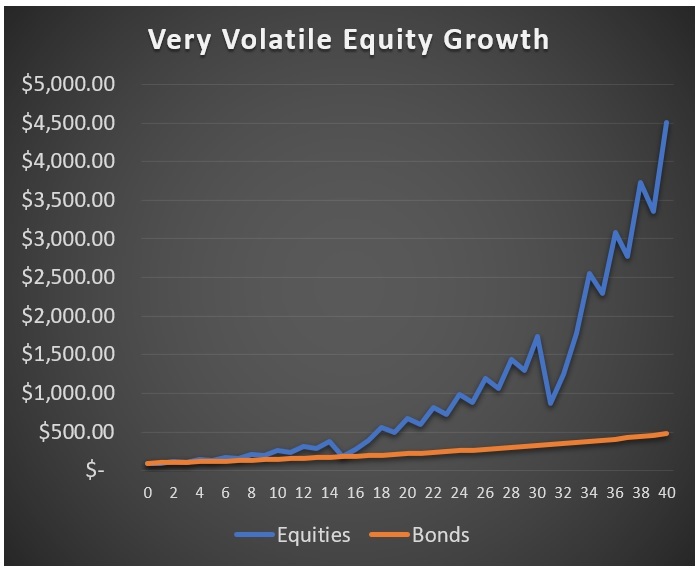 Volatility is how rapidly or severely the price of an investment may change, while risk is the probability that an investment will result in permanent loss of capital. Although they are correlated, since risky investments tend to also be more volatile, their correlation is not nearly perfect, and it’s up to investors to be able to spot the difference and take advantage of it. Volatility can be your friend if you manage it appropriately for your stage in life, while risk is the enemy to be minimized at all times. More specifically, paying attention to market valuation (as measured by CAPE, Cap/GDP, or any other valid metrics that you personally prefer), and keeping aware of how far you are into a business cycle, can help you make wise asset allocation selections. Not based on market timing, but based on analysis of current market valuation and what your alternative investments could be. Using these simple metrics, I had a conservative position in 2007/2008 that preserved capital well, shifted significantly into equities in March and April of 2009 to fully benefit from the recovery when equities were cheap, and for the last couple years have been slowly dialing back equity exposure now that stocks are getting expensive 8 years into a market expansion.